The food did not disappoint. The meal started with a piece of foie gras which was followed by the main course, pork served with gnocchi. 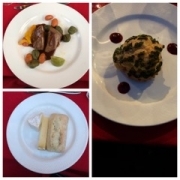 At every table, there were also bottles of red and white wine, while everyone also received a glass of champagne early in the evening to give the banquet a celebratory feel. After those first two courses, and appropriately enough since we were in Paris, there was the cheese course. The final part of the meal was a dessert, a delicious French pastry with a cream filling that paired well with the espresso that was served along with it. The meal wasn’t the only lovely part of the evening’s festivities. Throughout the night, a pianist and a violinist played different songs, ranging from classical pieces to show tunes to more popular numbers. Some people were even inspired by the music to dance. There was also the unveiling of a work of sculpture by Vernonique Chabrolle that was inspired by Hemingway. That piece of sculpture was auctioned, (yes, actually auctioned) off by Stoney later in the evening to raise money for the conference travel fund for graduate students. Once the rain stopped, the top deck of the ship was open. After a week of blisteringly hot temperatures, getting to spend part of the last conference night in Paris out in the open and cooler air was remarkably pleasant. 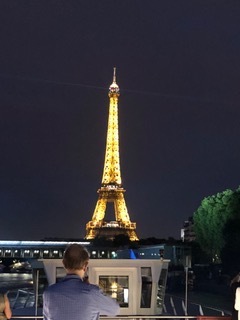 Our boat moved up and down the Seine river, passing the Eiffel Tower, Notre-Dame Cathedral and the Musée d’Orsay and all the other Paris landmarks. We ate, we drank, we took pictures, we talked, we reminisced. I can only speak for myself but I was having a lovely time and with all of the official conference business finished it was one that I didn’t want to end. But, unfortunately, the boat couldn’t stay out on the river all night and we began to pull back into the dock. There were thanks to be said, to Stoney and to site directors Alice Mikal Craven & William Dow from the AUP for making all of this possible. After the thank yous, Stoney provided some final closing remarks, ones that brought things full circle from his remarks at the opening reception on that scorching Sunday afternoon, and then led us all in song (specifically, one about Hemingway) before calling the conference proceedings to a close. Even though we’d reached the dock and it was starting to get late, people were in no hurry to leave. We stayed on the boat, talking more and saying goodbyes. Then in the parking lot near the dock, in the nighttime summer air cooled ever so slightly by the rain that fell earlier, we stood together, not wanting to actually admit that both the evening and the conference had drawn to a close. But eventually people had to catch Metro trains or finish packing for their flights tomorrow and we all dispersed into the night. Yeah, we knew we’d see each other again. Maybe it would be at ALA, maybe at the Fitzgerald Society conference or another academic gathering. Maybe it wouldn’t be until the next Hemingway Society conference, which will be in 2020 in Wyoming and Montana. We’d all keep up through the various and sundry forms of social media and electronic communication as well. But even while knowing and acknowledging all that, it was still tough to say goodbye. After spending a week in a lovely city like Paris and with the wonderful people who are a part of the Hemingway Society, it’s hard to leave all that behind and head back to reality.